HOLLIDAYSBURG, Pa. (CNS) — Bishop Mark L. Bartchak of Altoona-Johnstown committed the Pennsylvania diocese to be transparent in its efforts related to the sexual abuse of minors by clergy and to make public the names of all priests found to have a credible allegation of abuse against them and the status of each man within the diocese. The pledge came during an afternoon news conference March 3 at diocesan offices in Hollidaysburg, two days after a state grand jury issued a report saying that at least 50 priests or religious leaders were involved in the sexual abuse of hundreds of children over several decades and that diocesan leaders systematically concealed the abuse to protect the church’s image. The list of priests accused of abuse will be published on the diocesan website, www.ajdiocese.org, Bishop Bartchak said. The diocese made a copy of the statement Bishop Bartchak read to the media available online. The bishop apologized to abuse victims, their families, people of the diocese and priests. He also urged people with information about suspected abuse to call the hotline announced as the report was released, (888) 538-8541. People also may call Jean Johnstone, the diocese’s victim assistance coordinator for additional support at (814) 944-9388. The grand jury report details dozens of incidents of abuse — sometimes in graphic language — by 34 priests against hundreds of victims, some of whom were as young as 8 years old. It said other complaints had been made against a teacher who was studying to become a deacon, a choirmaster, a coach and members of religious orders. Grand jurors outlined actions by Bishop James J. Hogan, who led the diocese from 1966 until 1986 when he retired — he died in 2005 — and his successor Bishop Joseph V. Adamec, who retired in 2011, for failing to report abuse allegations to police. Bishop Adamec denied any wrongdoing hours after the report was released in a filing with the Allegheny County Court of Common Pleas in Pittsburgh. Filed by Pittsburgh attorney David J. Berardinelli, the response charged that the grand jury “was not provided with a full and balanced set of facts based on all the materials and information that were available.” It said the report “contains criticism that is unfounded. 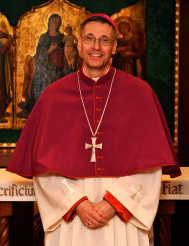 The filing outlined several steps that Bishop Adamec took to suspend priests from ministry and that his actions followed the procedures in effect in the Altoona-Johnstown Diocese prior to the adoption of the charter for the protection of children in 2002 and afterward under protocols adopted by the USCCB in the charter. The grand jury report commended Bishop Bartchak for cooperating with the state’s investigation and offered recommendations for the diocese to consider in its handling of abuse allegations, including keeping the needs of abuse victims foremost. Bishop Bartchak thanked the grand jury for recognizing the progress the diocese has made in handling abuse cases in the five years he has led the diocese. The bishop’s statement concluded by saying that the people of the diocese can find comfort and healing “from these wounds” through prayer for all who have been harmed and all who have been affected. Plans are underway for prayer services for mercy in the near future, he added.